Dianna thought that for awhile 'Piceno' was going to replace 'Sorbonne' as her favorite pink, but then 'Sorbonne' came into flower again and she decided it was a tie! As with 'Sorbonne', 'Piceno' is not only exceptional in both form and color, but also fade resistance even in the warmer areas of the US. These solid fuchsia pink flowers are classified as being �flat faced� meaning they are wider than the more bowl shaped flowers and they have a slight curl to the petal edges and at times sport a tiny thread of white on their edges. 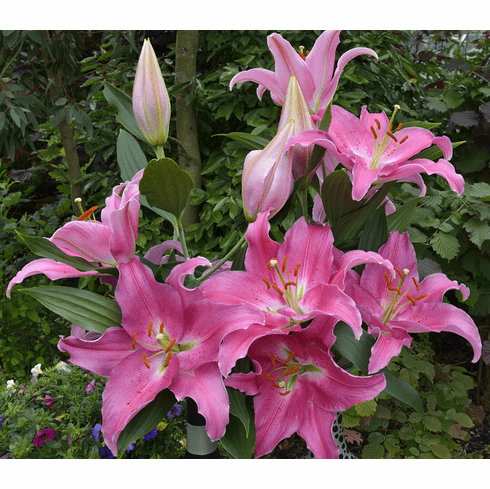 The fragrance is fantastic and we have found the sturdy stems on this lily to exceed the norm. As color fast as we have found this lily to be in full sun here on the farm, being a pink, if your summer temps regularly hold at about 85 or more in July, even 'Piceno' should be placed in some light afternoon shade in your garden. 3 to 4 Feet. Late July/Early August Flowering. Fragrant.